Recently, I had the opportunity to facilitate an online discussion forum for one of UniSIM’s Core course called “Thinking Critically”. At the end of the course, I invited my students from three seminar groups to provide feedback on the online facilitation. Out of 76 students, 23 responded to the survey. This post is a synthesis of my students’ feedback on selected questions and my reflection on that. I found it useful to break down the task so that I was clear about what to do and when. The initial stage involved connecting with the students. Since I would not be meeting my students at all, I decided to post an introductory, 10 minute video online and inform students through Blackboard. In this video, I introduced myself and gave information about the course outline, assignment requirements, and grading criteria. In addition, I explained my role in the discussion forum, expectations of students, why it is important for students to participate regularly and suggested how students can schedule their time. I also made use of the General forum to post the video link, write a short introductory note and invite students to do the same. As you might know, we have a General forum and a Topic forum in all our e-courses. Often, students overlook the General forum since it is not graded as the Topic forum. While preparing, I was not sure if students would find the General forum useful since the graded discussion activity is only for 10 days and students would have to respond to 2 questions within that time – this too in the midst of other commitments they would have. To my surprise, students did post in the General discussion forum. 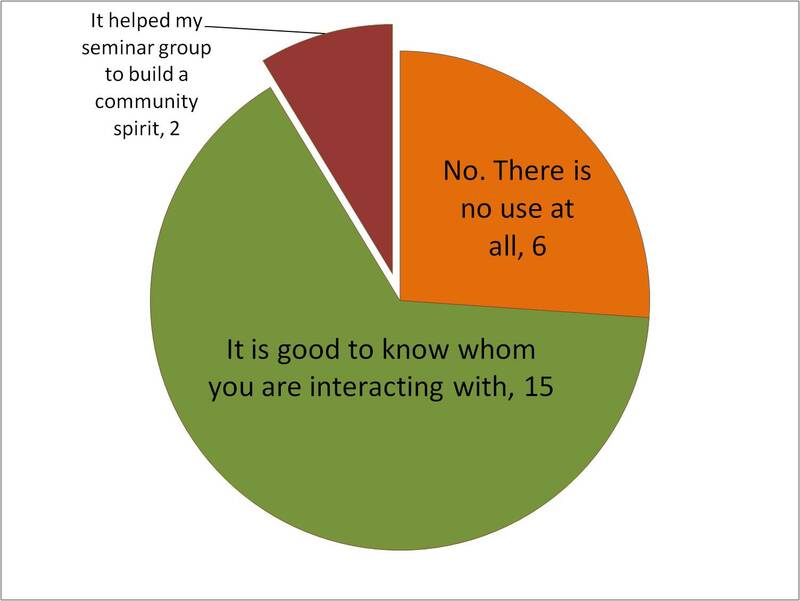 In their feedback, students responded that they like to know whom they are interacting with- both with the classmates and with the instructor. 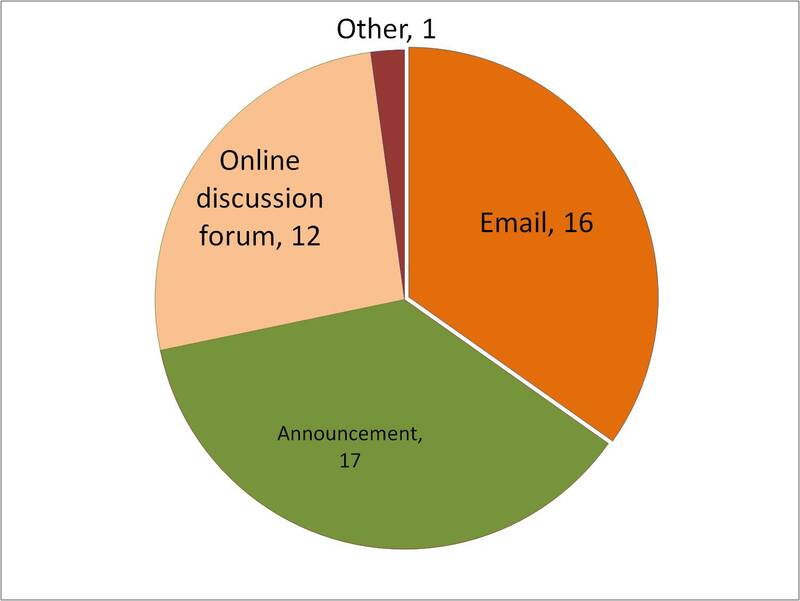 Although, the General forum consisted of mostly just a single post from each student, it served as a virtual meeting place to connect with each other. If the question is whether the General forum contributes to learning, the answer is probably “No”. But it does provide the opportunity to create a sense of familiarity (with each other), which in turn allows for a collaborative learning environment. I regularly communicated with students through various channels such as announcements, responses on discussion threads, and emails. Using multiple channels than just relying on discussion threads helped in reaching out to students. Students’ response also indicated the same. In cases where I needed to communicate with selective student/s, I would email them individually. For instance, one of my students had posted three times, but all of the posts were empty. Checking directly with the student allowed me to find out what was the problem. So, the choice of communication depends on your purpose. As for the clarity of instruction provided in the forum, most were satisfied but there were a few who felt that certain instructions could have been clearer. Unfortunately, these students did not inform me or clarify with me during the discussion period. 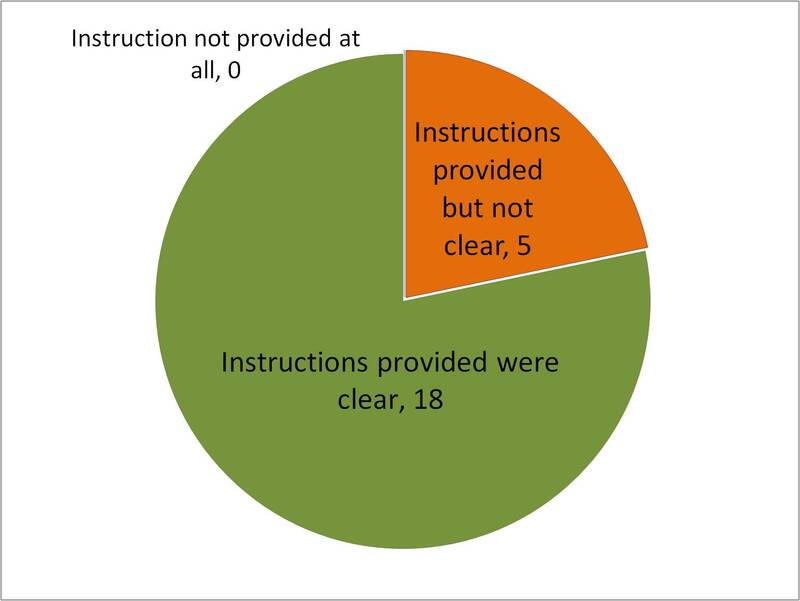 Since some students may not be forthcoming in seeking clarification, I think that it is essential for us as instructors to be as clear as possible (and use multiple channels) to provide information. In order to do that, we need to be clear about our role in the first place by checking with our Associate Faculty (AF) and Heads of Programme (HoP). Also, it will be good for instructors teaching the same course to share information and discuss together from time to time. The course AF and HoP can also hold briefing sessions with the instructors ahead of the class. In addition, they can send relevant information as and when needed, especially if the course has a large cohort. Setting expectations on the number of posts and the frequency of posts seemed to have worked to some extent. I was glad that at least half the class was regular. However, some students may need to be reminded frequently. 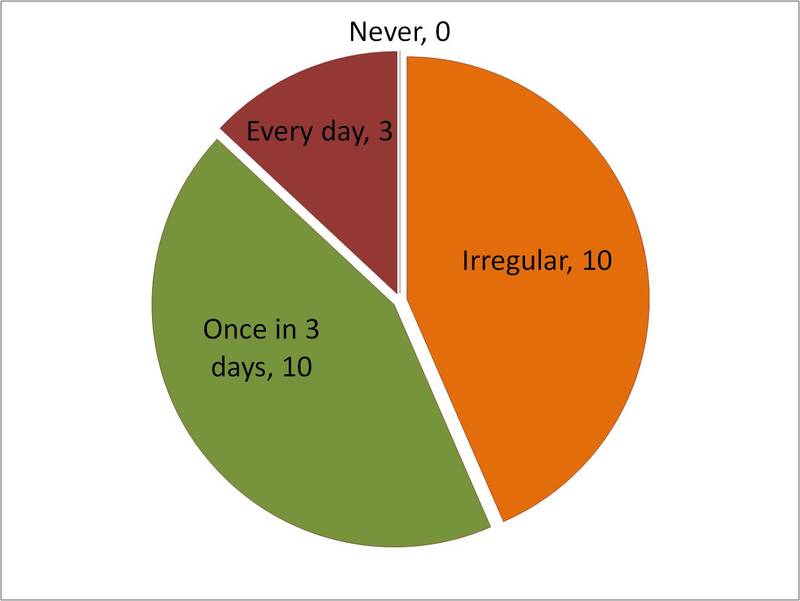 Given that time management is one of the biggest challenges for our students, we may need to support them by properly scheduling the tasks. As part of the facilitation, I also found it necessary to bring out the big picture on how students responded as a group. Often times, students are only worried about their own response, and they tend to focus on only the first part of the discussion question. So, we should remind students to look at the discussion in its entirety, cover all aspects of the questions and refer to the rubrics. This can help ensure that the discussion is meaningful in achieving the intended learning outcomes. Questioning responses and encouraging students to critique each other or engage in constructive dialogue are ways to stimulate higher order thinking skills. Since feedback is important for learning, I also made it a point to synthesize the ongoing discussions and post brief summaries to the class on a regular basis. At the end of the discussion activity and after assessing the responses, I provided my key observations and indicated what went well and can be improved. Overall, it was an enriching experience for me. As an online instructor, I found my role to be that of guide. While the actual discussion was driven by the students, I was there to welcome, orientate them, set out the agenda for the learning journey, help them along the way, highlight their strengths and what to watch out for, encourage them, ensure that they are in the right direction and guide them towards reaching the desired outcome of the activity. If you are going to be facilitating (graded or not) online discussions, here is a list of tips that you will find useful. Wish you all a productive online discussion in your courses as well. Image | This entry was posted in June 2013 and tagged Blackboard, Blended learning, Connecting with students, e-learning, Feedback, Internet forum, Online learning, Reflection, teaching effectively, YouTube. Bookmark the permalink.